Flemish painter. He attended the Academie at Bruges and studied under Bernard Fricxs (1754-1814). He had won several prizes in Bruges and established a reputation in Ghent and Brussels before exhibiting in Paris in 1799 where his work won further acclaim. With Joseph-Benoît Suve s encouragement he settled in Paris and developed a fashionable society clientele. The seriousness and sobriety of his first portraits bear similarity to Jacques-Louis David s style of portraiture. During the Empire Kinsoen worked for Napoleon s court and in 1808 became court painter to Jerome Bonaparte, King of Westphalia, whom he followed to Kassel in 1810. There he fell under the influence of Franois Grard, also active as a portrait painter to the imperial family, and adopted the more superficial style then in favour with his wealthy clientele. Kinsoen painted some particularly attractive portraits of women, striking in their air of refinement and elegance (e.g. 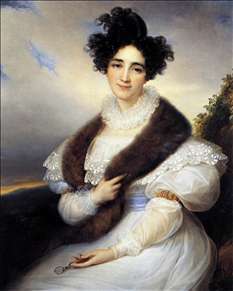 Mme R. Lafont, c. 1835; Bruges, Groeningemuseum), while continuing to execute official portrait commissions. With the overthrow of his patron in 1813 Kinsoen returned to Paris and in 1816 was appointed painter to Louis-Antoine de Bourbon, Duc d Angouleme (1775-1844), whose portrait he had painted two years earlier (Bordeaux, Muse des Beaux-Arts). 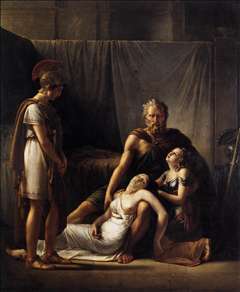 In 1817 he produced his only surviving history painting, Belisarius at his Wife Antonina s Deathbed (Bruges, Groeningemuseum). 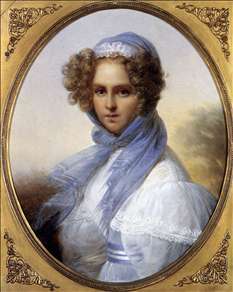 From 1820 he exhibited regularly at the Ghent and Brussels Salons where his portraits were highly regarded, most notably those of the Prince of Orange and the Princess of Orange (both 1821; The Hague, Oranje-Nassau-Museum). He continued to work as a court painter in Paris until 1830 when he moved back to Bruges. His studio was bought by the English collectors John and Josephine (1825-74) Bowes, founders of the Barnard Castle Museum, Durham, which has several portraits by Kinsoen. See more details about "Portrait of Jeanne Bauwens-van Peteghem"
See more details about "The Death of Belisarius' Wife"
See more details about "Portrait of Marie J. Lafont-Porcher"
Presumed Portrait of Miss Kinsoen. 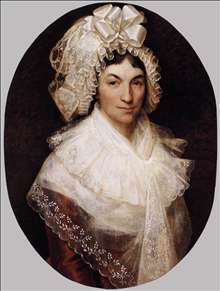 See more details about "Presumed Portrait of Miss Kinsoen." 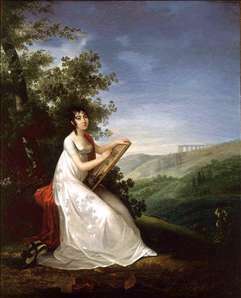 See more details about "Portrait of Adèlie Auguié"